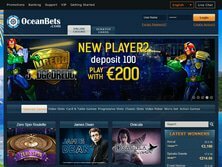 Oceanbets Casino has a nice main page which features images of the ocean, boats and clear blue water. The online casino wants to be the ultimate relaxation place for players. It publishes an extensive winners list, which ilustrates that large sums of money can be won at the casino. All the prizes can be picked up from the comfort of one's home, which makes the online casino more attractive than a traditional venue. The bonus terms & conditions section features a line-up of promotions. It all starts with the impressive welcome package. It is a 300% player welcome bonus. 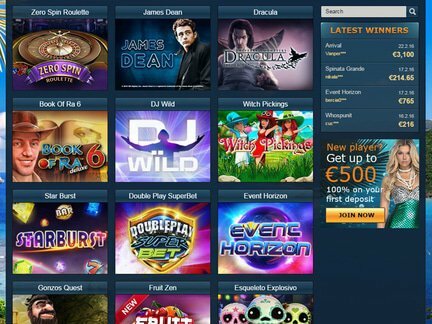 A first deposit must be made before a player can pick up the Oceanbets Casino Bonus deal match up to €900. The website also hosts a number of special bonuses. For example, a payment method deposit bonus allows the player to receive a bonus of 15% on selected payment methods. There is also a free spin bonus. This is a bonus from winnings of free spins. Comp points can likewise be collected at the casino. The exchange of the comp points for money can be very extremely beneficial to the player. In terms of payment methods, the players can count on the following services; Visa, MasterCard, Maestro, Neteller, Skrill, PaySafeCard and Visa Electron. The security policy is also transparent. Financial security is always guaranteed! All the transactions are conducted in accordance with the highest standards. During the registration process, the player's information is stored in a safe place. The whole sign-up process can be quick. Only a brief form needs to be filled out by the user. After the process is completed, the player can immediately launch the games. Oceanbets Casino website can be accessed in the following languages; English, Spanish, German, French, Danish, Finnish, Italian, Norwegian, Russian & Swedish. Registration is currently prohibited to players who live in countries like; United States of America, Turkey, Israel and Singapore. However, the restrictions can also apply to residents of countries where local laws prohibit such activity. Otherwise, the casino is very open when it comes to registrations. The featured game category would include; Zero Spin Roulette, James Dean, Dracula, Book of Ra 6, DJ Wild, Witch Pickings, Star Burst, Double Play SuperBet, Event Horizon, Gonzos Quest, Fruit Zen, Esqueleto Explosivo, A Christmas Carol, Lord of the Ocean, Merlins Magic Respins, Superman, Foixin Wins and Gladiator. The website is a treat for fans of game categories like; Video Slots, Card Games, Table Games, Progressives, Slots, Video Poker, Micro bet & Action Games. The Classic Slots category is particularly interesting, since it features intriguing games such as; Fashion Slot, Lucky Fruits, Pharaoh Fortune, Disco Slot, Olympia, Cash Machine, Crazy Pizza, Magic Forest, Beauty Slot, Horse Racing, Devil Slot, Angel Slot, Flower Slots, Motor Slots, Wild West Slots, Cosmo Slots, Bow Wow Slots, Banana Slots, Aero Slots, Lemon Slots & Aqua Slots. No complaints can be seen on any public forums. It could be due to the fact that this is a new online casino. It will be interesting to see wheher the clean slate can be maintained in the coming years. Right now, the casino maintains a number of contact methods. They would include; e-mail and live chat. Since the website supports several languages, the players can receive help in their tongue. The website is owned by Game Tech Group N.V., which is registered in Curacao. Its subsidiary is located in Cyprus. A Master license has been obtained in Curacao. Unfortunately, the license does not carry much value in the online casino world. This is a business license. The licensing body does not carry out an investigation which could help in the average player's discernment process. My attention was drawn to the classic slots on the website. I loved playing the games! I thought that the casino wecome package was likewise very good. It's uncommon to find a €500 deal! In my opinion, the casino will likely appeal to a large audience due to the language support options and great web design! I have a good feeling about this casino. Apparently, the good feeling is shared by other players.